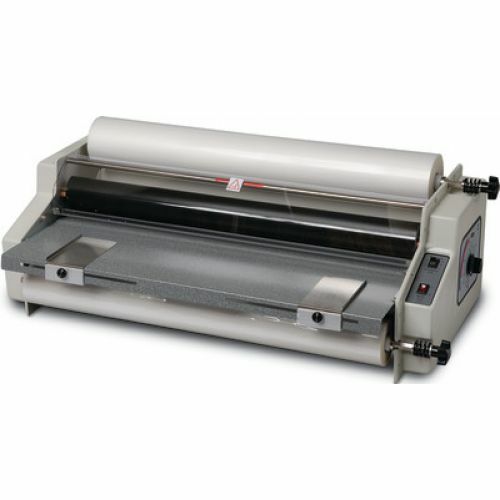 Convenient laminator with reverse motor switch, spring loaded rubber rollers, cooling fan and heat control. Preset lamination pressure and speed makes the machine easier to use. Reverse switch to avoid problems or clear misfed materials. Adjustable-heat control allows you to use films up to 5 mils thick. Supply roll tension knobs provide the control you need for wrinkle-free results without complicating your work. Automatic forced air cooling for laminating 3 and 5 mil films, as well as 1.5 mil film. Attached safety shield made of clear polycarbonate so users can see their work with the shield in place.